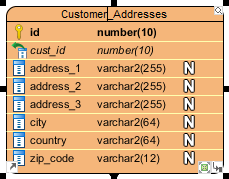 Finding differences between databases is a tedious job. 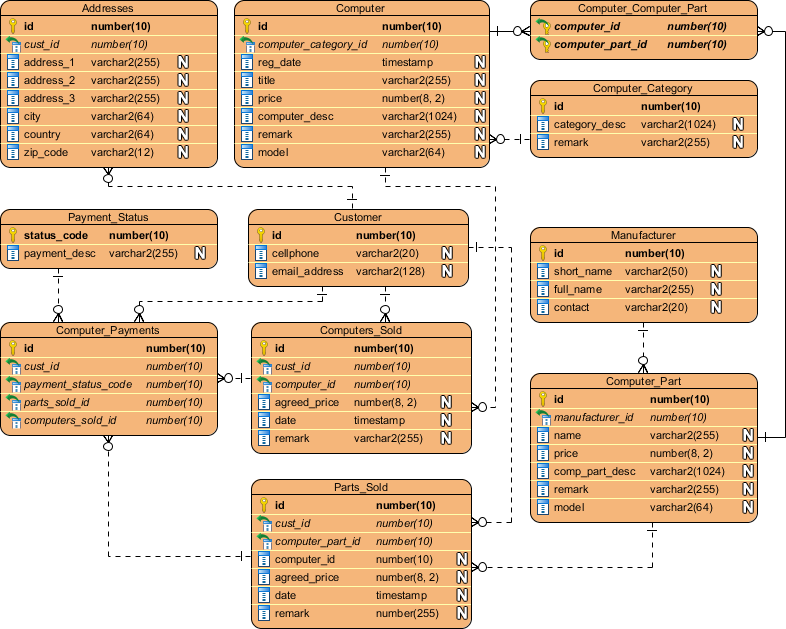 Visual Paradigm provides a "visual diff" function for database administrator to compare databases by showing their differences visually. 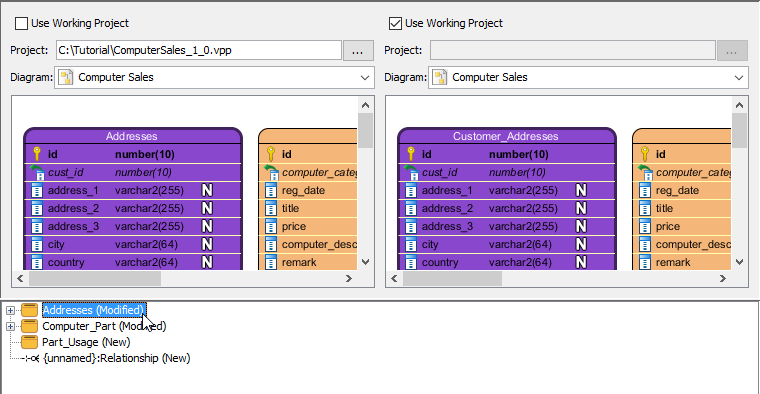 This tutorial shows you how to use visual diff to identify changes of databases from release 1.0 to the latest development version. 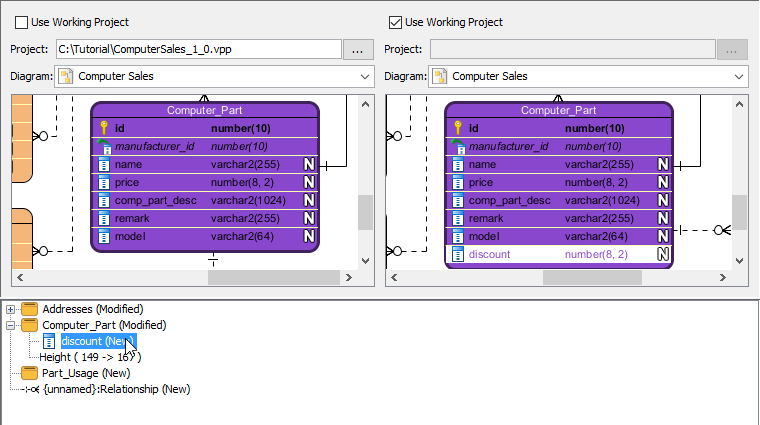 Here is the database design for the Computer Sales project. We are going to modify it, and then compare it with the original copy. Download ComputerSales.vpp. You can also find this file at the bottom of this tutorial. 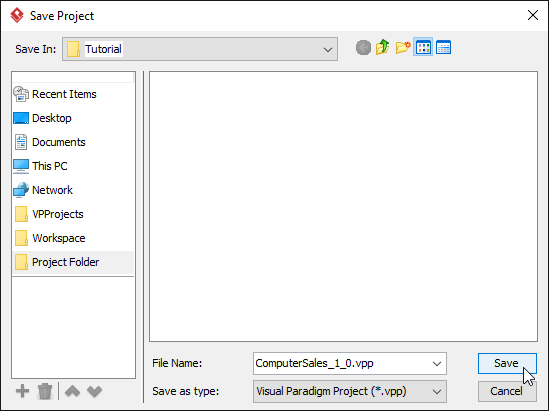 Open the downloaded .vpp file in Visual Paradigm. To open a project, select Project > Open from the application toolbar. Let's make a copy of the existing project by selecting Project > Save > Save as from the application toolbar. Name as ComputerSales_1_0.vpp and click OK. Reopen the previous project by selecting Project > Open > ..\ComputerSales.vpp. Make a few changes to the project. Rename entity Addresses to Customer_Addresses. 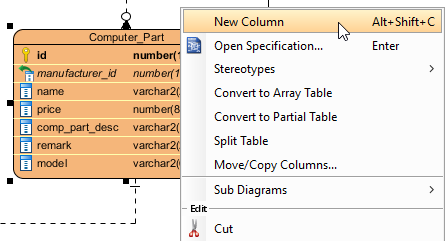 Add a new column to entity Computer_Part by right clicking on it and selecting New Column from the main menu. Enter discount : number(8, 2) as the column definition, press the Enter key and then the Esc key to confirm editing. 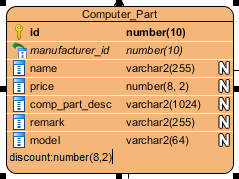 Create an entity with a One-to-Many Relationship -> Entity relationship from Computer_Part. Name the entity Part_Usage. Add the following columns to Part_Usage. 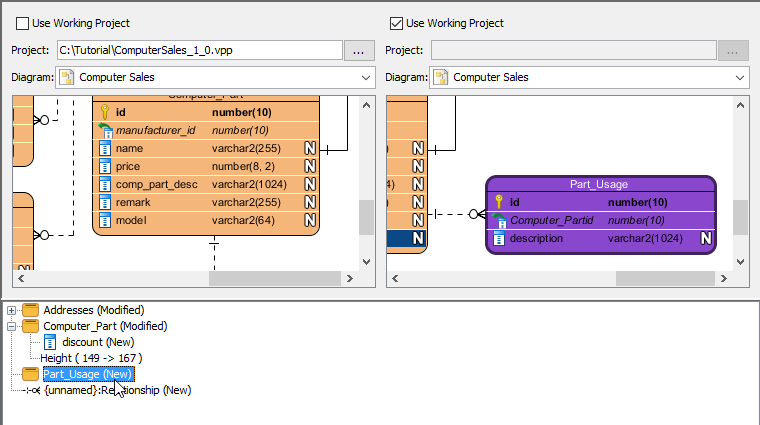 Open Visual Diff by selecting Modeling > Visual Diff from the application toolbar. In the Visual Diff window, uncheck Use Working Project on the left hand side. Click ..., select the ComputerSales_1_0.vpp and select Computer Sales as the diagram. Check Use Working Project at the right hand side. Select Computer Sales as the diagram of right hand side. The differences of diagrams are listed at the bottom part of the window. Select the differences one by one to see the changes. Visual Paradigm is focused - it has the requisite tools to get the job done without adding extraneous functionality, bloated code, and "noise" into the process.